Just curious, do people use the fin for anything else? 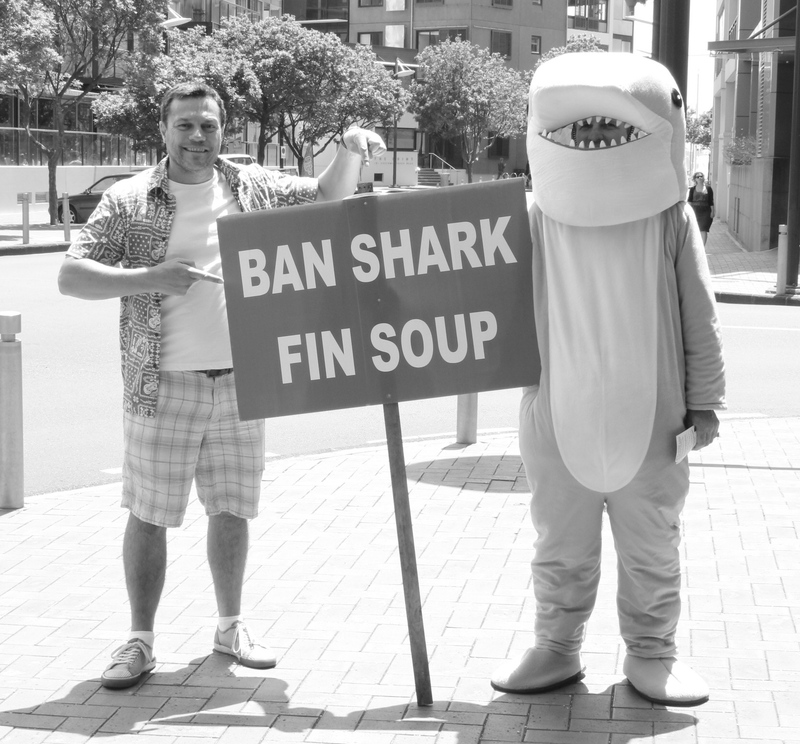 With all this focus on soup, we might be creating a generation of smarties who will conjure up shark fin jelly, sandwiches or vegemite and shark fin extract to side step this ban. We should ban shark fin harvesting full stop for whatever reason! I’m surprised that the folk who relish this dish don’t actually eat the rest of it. As they’re very resourceful in consuming almost everything else that clucks, has 6 legs’ or oinks. Sure go ahead and regulate the hunting of sharks, but also why not eat the whole damn thing when you catch it. Personally, I’m not fond of sharks because despite what people say they do look menacing, but I jot this down to my own ignorance. Surfboards with chomps in them, severed limbs and razor sharp teeth have fed my imagination and fears to heights beyond this planet. And I’m not going to face my fears by swimming or riding one. I’m afraid for the day when protesters don signs reading, “Ban Cockroach Wing Soup”, by then we would really have scraped the bottom of the food chain barrel and we deserve to be punished. Hopefully, we would have changed the destructive path to our selfish culinary delights to more sustainable levels. Cheerio, I have a can of shredded chicken to muscle open. What does “shucks” mean? Be careful those boots your shaking in, there full of turantular spiders. That explains them shaking boots. I’m never going to kiss a cambodian girl, spider lips not my favorite taste. Take care. Businesses?, … hundreds of millions to 1.2 billion dollars, … shark finning. If your not there to do the right thing, how can you stop shark finning. The majority of the sharks are painfully dying an agonising death before they are de-fin’ed. Year 2012, 50 to 100 million sharks, finned. Wait till you hear this one, turantular spiders cooked and eaten in Cambodia, a real delicacy there. Don’t be a male spider and marry a female spider, there’s no escaping the clutches of death. I never knew there were so many sharks in the sea. ‘Shucks’ Willis, your statistical rantings have me shaking in my boots, those numbers, standing end to end, would take me to quadrant Delta Z15.4 somewhere out in the next galaxy. I’ll remember to ask the gods in my next life to come back as a Cambodian and not a spider, let alone a male one. Thanks for the tip, I owe you one. My comments has been re-worded or changed. Is someone changing the comments or does it automatically correction it’s grammar? Let me turn off the ‘Otara to Remuera’ auto correct feature. Did you want it set back to ‘Otara’ mode? I’ve seen doco’s on Shark Fin “fishing”.. They trawl through the waters pulling up anything that gets caught in their giant nets, find the sharks & dolphins, cut their fins off while they’re alive, then chuck the de-finned bodies overboard back into the sea. Without their fins they sink to the bottom & die. The reason they don’t keep their whole bodies is that shark & dolphin meat is not worth much in the markets. To fill a boat with fins brings a far greater profit than filling with both. On a limited income, I still try and buy free-range & sustainable products. Sealord have just started canning Albacore tuna which is line fished -probably the most sustainable canned tuna you can purchase (in NZ at least). I hope thats not a pet turtle on your Facebook profile that you’re keeping for a soup recipe? Know what you mean about NOT swimming with dem sharks!! The above picture is the closest I’ve been to a shark, and I’m still scared.